Union members waited outside the room while negotiations were underway. 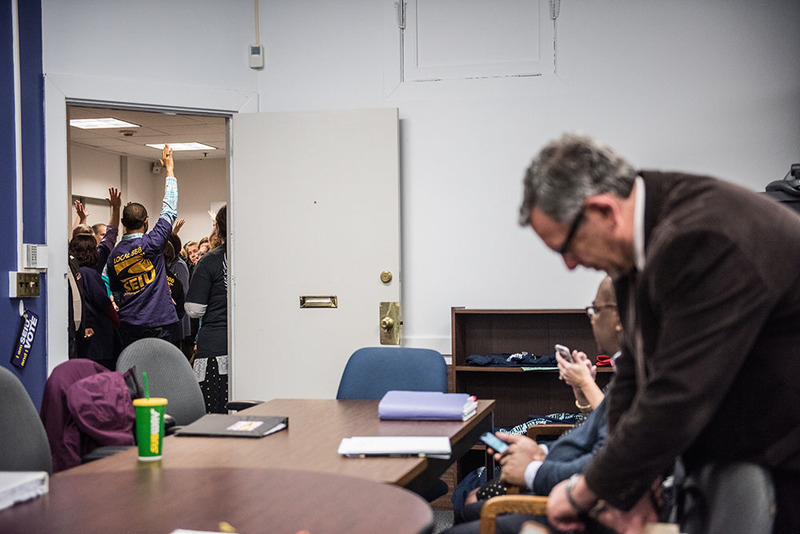 Between 40 and 50 college staff union members waited in the cramped hallways outside of the union’s office in 145 Tremont St. to greet Emerson administrative officials participating in the union’s collective bargaining negotiation on Tuesday. It was intended as a show of solidarity with the union’s collective bargaining committee. “We wanted a show of unity, but in a non-confrontational way,” Estelle Ticktin, administrative assistant to the communications studies chair said. Ticktin is on Emerson’s chapter of the Service Employee International Union Local 888’s collective bargaining committee. Ticktin said college officials prompted the show of unity by implying in previous meetings that other union members did not support the committee or want to be in the union. Some union members have said the college is stalling in negotiations. Staff members had originally planned to wait outside 145 Tremont St., but inclement weather forced them indoors. They greeted college officials as they stepped out of the elevators and walked into the room where negotiations were to take place. “They seemed a little surprised,” Ticktin said. Union organizers handed out pins and served coffee and donuts during the event. Inter-Library Loan Coordinator Allison Boudreau said negotiations have been slow, but that she trusts the bargaining committee to represent her interests. “I’m optimistic they have my best interests at heart, and they’ll fight for that no matter how long it takes,” she said.